A Status Quo acoustic album? Oh dear, how embarrassing. Admit it, some of you thought that without hearing it, didn't you? If you're of the mindset that it won't be any good without trying it, save us both some time and move along. I personally enjoy both the "Frantic" era of the band and their recent output. I've loved all their albums since 'Heavy Traffic' and was more than ready to give 'Aquostic' a shot, despite the fact that it might not be 'Quo' as we know them. 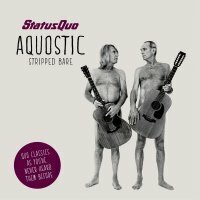 'Aquostic' will shock a lot of people – and I'm not just talking about the cover where Francis Rossi and Rick Parfitt are stood starkers with only their guitars to cover their modesty. What they have managed to do is take a variety of material from all different parts of their career and reinvent them in an acoustic format. The genius of it is the songs retain their foot tapping appeal and work – they work really, REALLY well. Instead of simply doing everything on a pair of acoustic guitars, the band employ all manner of additional instruments with percussion, Parfitt's ukulele, Bob Young's harmonica, an accordion, female backing singers and a string section to give many of these songs a totally new slant. For example, the intro to 'Mystery Song' played by a string section sounds fantastic. An accordion on 'Paper Plane', are you mad? Yet it sounds amazing! That's the appeal of the record, the unexpected. This truly is Quo as you've never heard them before. If you know of Hayseed Dixie, you know the way they can take a Rock song and re-imagine it with a banjo, fiddle and mandolin, yet still make it work and instantly recognisable – that's what this album is like. The arrangements are magnificent and the harmonies on the single 'And It's Better Now' are nothing short of inspired. The other appealing thing is Quo haven't just picked the "classics" – yes, 'Rocking All Over The World', 'Whatever You Want', and 'Down Down' are here, but so are deeper album cuts like 'All The Reasons', 'Na Na Na' and 'Reason For Living'. The often maligned 'Marguerita Time' works beautifully in this setting, sitting happily alongside the unlikely but inspired choices of 'Don't Drive My Car' and 'Little Lady'. Despite the amount of material on offer (over twenty tracks) none of them outstay their welcome and it's quite simply a really enjoyable listen. After releasing a batch of "Frantic Four" era recordings, I think Quo were wise to do something completely different and this certainly is. Give 'Aquostic' a try; you may well be very pleasantly surprised!